The following is a summary of a doctoral thesis defended in 1978 by Lucien Choudin, a dentist and Voltaire scholar from Ferney-Voltaire. The French have a particularly vicious word for tooth loss - "edentation"; it does exist in English but is not nearly so common; poor Voltaire! 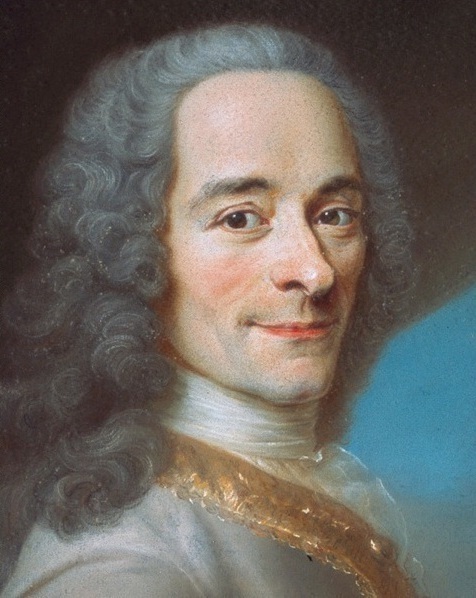 Doctor Choudin's starting point is the famous pastel portrait by Quentin de la Tour, completed in 1735 and now in the château at Ferney, which shows Voltaire with his teeth intact. His features are symmetrical, his nose prominent and his lips thin. His bottom lip juts slightly forward but his mouth holds a vertical line, confirming the presence of teeth within. The first evidence for dental trouble is letter of 26th January 1749 to Frederick II written from Cirey in which Voltaire mentions an illness which has made him deaf in one ear and caused him to lose his teeth. This episode cannot be securely dated (except that it took place after the La Tour portrait of 1735). In June 1750 Voltaire arrived in Prussia where in 1751 he suffered from an inflammation of the gums ("une fluxion s’est jetée sur ses gencives") which resulted in further tooth loss. In a letter of 19th December 1752 to his friend Jacques Bagieu he remarks that he brought about twenty teeth into Berlin but now has only around ten ("une dizaine"). There is scant evidence on which to base a diagnosis, but Doctor Choudin bravely comes up with a type of scurvy which causes periodontitis and has an incubation period of ten years or so. Voltaire at this time suffered from poor health and had a stressful public and personal life. It is also probable that the initial tooth loss led to poor dental occlusion (he couldn't bite properly!) and loosened his other teeth. Voltaire himself was very conscious of his toothlessness and its attendant problems. To start with at least he had difficulty enunciating. In January 1751 he wrote to the comte Argental: "to play Cicero, one must have teeth and my illness has made me lose most of mine. I am only an old dotard". To the duc de Richelieu, from Berlin, on 31st August 1751 he commented, "what a fine conversation it is when one can no longer articulate". Eating was also troublesome. In December 1751 he declined Frederick's dinner invitation since he was obliged to avoid "royal feasts for which one needs teeth". Voltaire was also aware that the loss of his teeth made his his mouth and cheeks cave in: in March and July 1752 he complained that he "no longer had a face". Doctor Choudin rather cruelly assembles the sculptural evidence for the progressive collapse of Voltaire's profile. A bust by Paul-Louis Cyfflé, executed in the course of Voltaire's visits to Lorraine in 1748 and 1749, shows the effects of his partial loss - lips thinner, wrinkles round the mouth and already a definite tendency for the bottom jaw to draw inward in round the mouth. Sculptures by the local Ferney sculptor Joseph de Rosset in 1767 and Houdon's famous final study further illustrate Voltaire's inexerable decline into toothless old age. Happily from 1753 onwards Voltaire suffered no further major dental problems and managed successfully without false teeth although his digestive troubles were no doubt aggravated by his inability to chew. .Doctor Choudin later became President of Voltaire à Ferney and played an prominent role in securing the acquisition of the château by the French government in 1999. As well as the thesis he wrote several other pieces on Voltaire and amassed a notable collection of books and artefacts. Voltaire in profile: Cyfflé, Rosset, Houdon.